Where can I find a coloring puzzle? This is an awesome puzzle if you are into puzzles. It is, however, very challenging to put together as the whole thing is black and white with random designs. It takes in average, for a pro puzzle builder, over 30 hours to put this together. The coloring is yet another challenge because it is a fairly large puzzle. We would not recommend this product to a beginner or casual puzzler or colorist because it is a serious time commitment from start to finish! For those who love puzzles and coloring, though, it is a great source of entertainment. 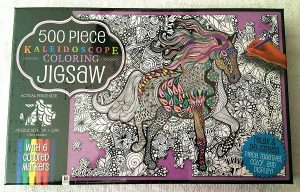 Get your brand new coloring jigsaw puzzle now! This entry was posted in Toys & Games and tagged cat, coloring puzzle, colouring puzzle, horse, jigsaw, jigsaw puzzle, puzzle, unicron on March 4, 2017 by WhereCanWeBuy. Where can I find these kids shoes? Where can I buy a Thor hammer tool set? Where can I buy a magnetic window cleaner for triple glazed windows? Where can I buy an ocean shaped soap? A purse from a photo! WhereCanWeBuy on How can I save room to park my bike?